Completed 2013 | 4150 sq. ft. 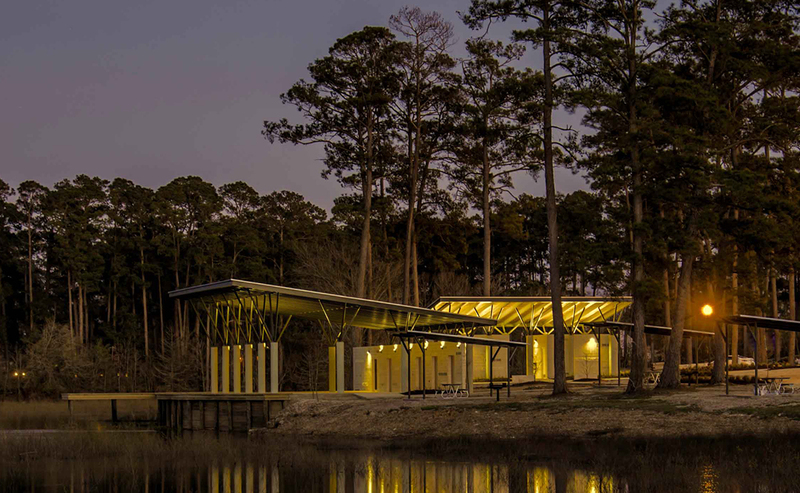 The Eunice City Lake Recreational Facility is sited on an undeveloped portion of the Eunice City Lake, comprised of a main pavilion, restroom pavilion, boat launch, fishing piers, and picnic shelters. 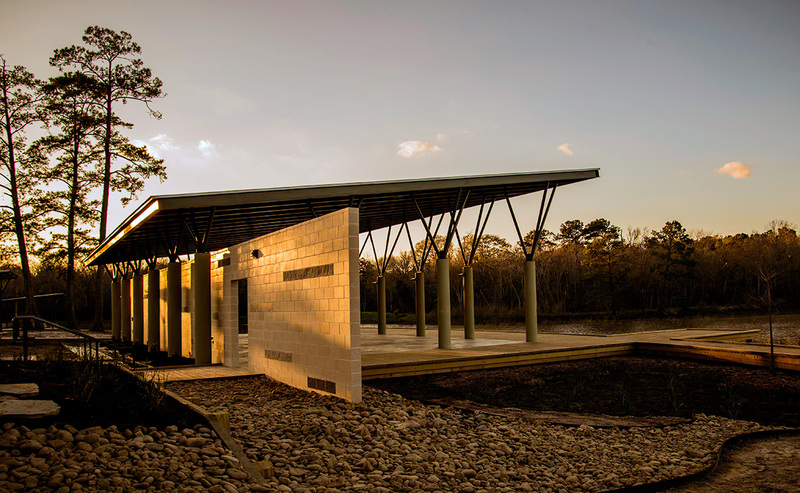 The parking area is connected to the lake by a linear path juxtaposed with the natural curve in the bank of the lake with the restroom pavilion, picnic shelters, and native/drought tolerant landscaping flanking both sides. The punctured masonry wall helps divide the park to support multiple simultaneous events, leaving only a glimpse of the lake beyond. 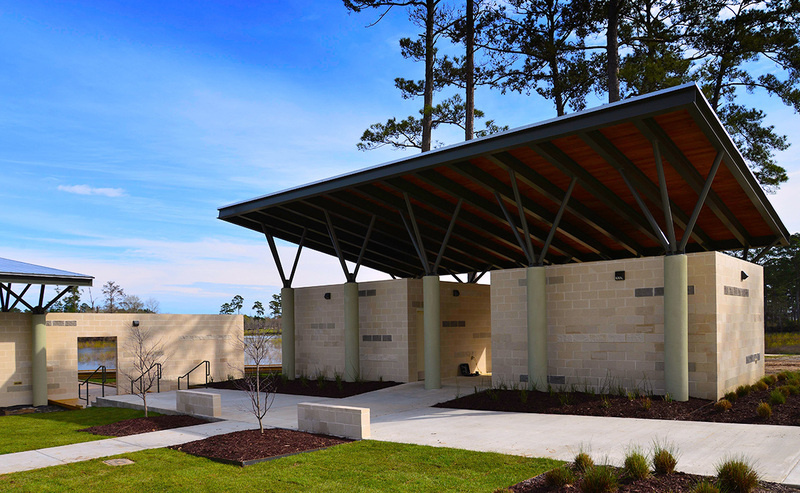 The concrete path transitions into wood decking as the masonry wall slides through the main pavilion. 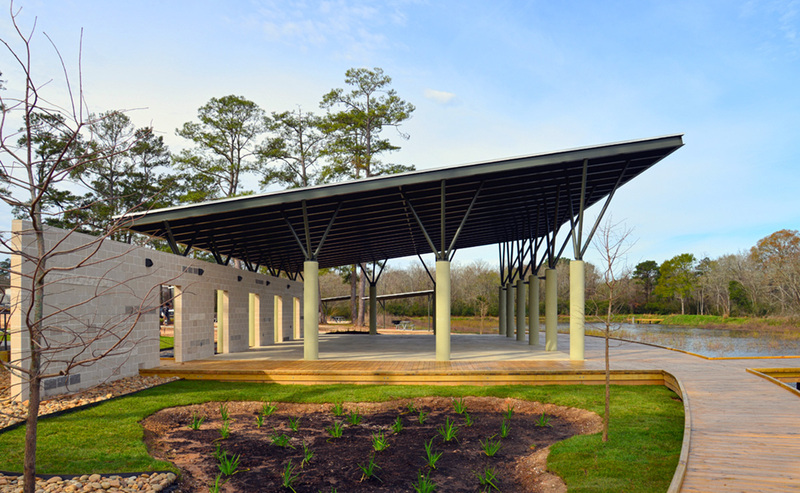 The soaring roof of the main pavilion is angled to maximize shade throughout the day, while encapsulating the picturesque view of the lake. 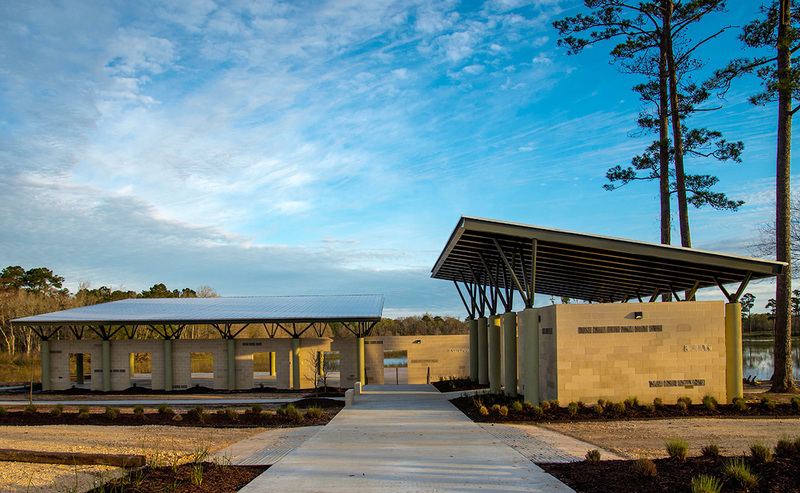 The aesthetics infuse the vernacular structures of the agrarian silos dotting the surrounding farms with the simple anatomy of the native Loblolly Pines. 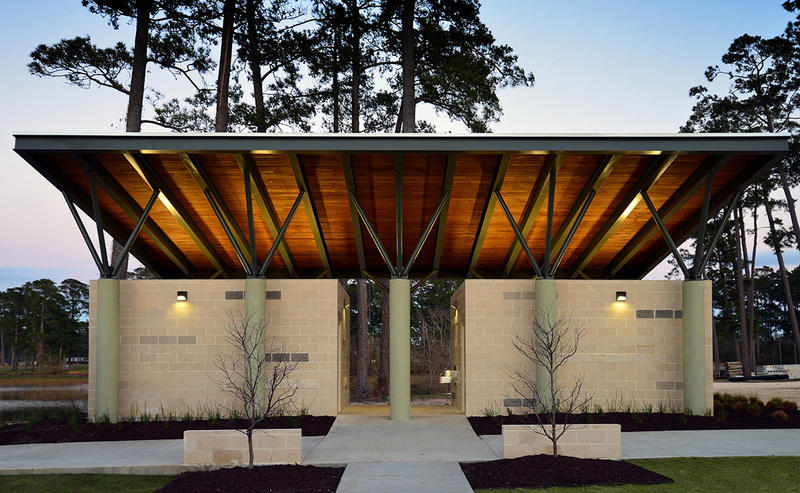 The oversized roof canopies float in the air as the metal and concrete branch-like columns gently touch the ground. The use of various masonry textures assist in breaking down the minimal design to blend within the context of the site. The linear landscaping beds compliment the architectural spaces while naturally filtering the rainwater. 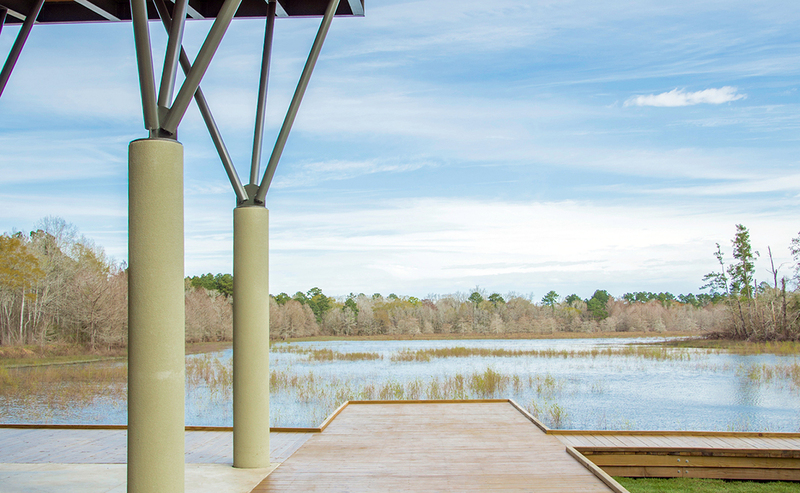 Once all phases of the project are complete, the recreational facilities, along with the fully stocked lake, will provide the residents with numerous avenues for recreational activities.